Unfortunately though, time is running out. Years ago I could stand on a ridge in the mountains as winter gales roared through the Alpine Ash forests on the slopes below me. There’d be black cockatoos on the wind and the first hard snow flakes rattling on my coat. It was a wildness that stung the eyes with raw beauty. Sadly those forests are dying. They are being burnt so often that they may be gone by the end of the century. Like the tallest hardwoods in the world and the thousand year old King Billy pines of Tasmania, they are places we have no room for in our fossil fuel economy. It’s not that fire is bad; our forests need it. But it’s coming so hard and fast in this changing climate. We fight the fires and we manage the fuels as best we can, but our best efforts are only as good as the science they are built on, and there are some hard questions to be asked about that science. At the heart of our traditional approach are hand-drawn dots on a graph from a leaflet published by Australian bushfire expert Alan McArthur in the 1960s. Nine data points telling us that if we halve the fuel load – the leaf litter on the ground – we can halve the speed of the fire. It has never been backed by evidence, but in the absence of something better it became the bedrock of Australian fire management. One rule for all forests: burn them. An aerial infrared photo of the fire edge near Jindabyne in January, 2003. But in the past two hundred years, Australian forests have been getting more fire than at any time in the tens of thousands of years before, and all of the controlled burning is not helping. 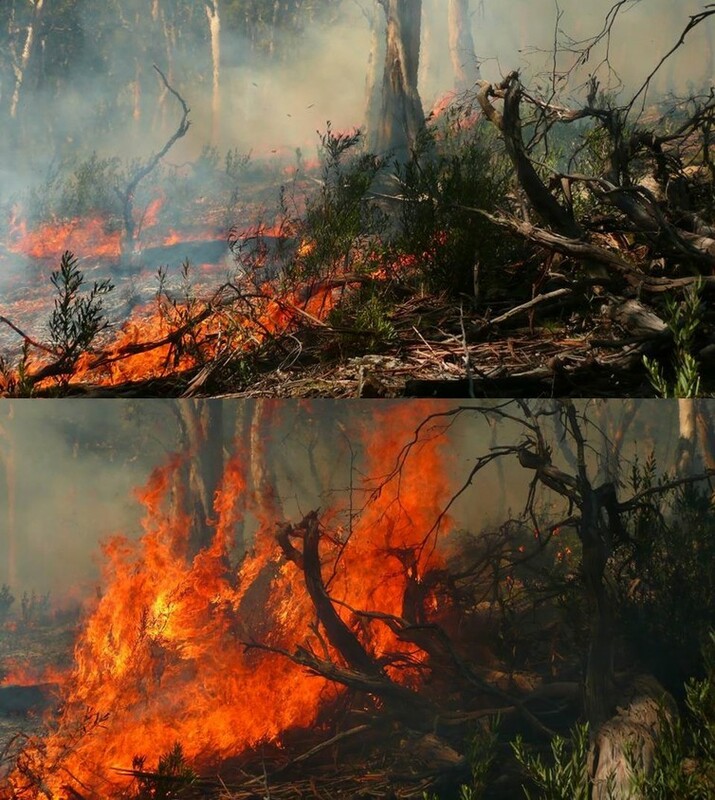 For 26 out of 30 bioregions in south-east Australia, there is no evidence that prescribed burning has reduced bush fire sizes. Clearly, it’s time for a rethink. Can a few centimetres of leaf litter on the ground really give us enormous crown fires? Any fire fighter will disagree, saying you need tree crowns to get a crown fire. The issue then is not how much fuel you have, but whether flames will span the gaps to ignite those plants. Flames burning surface litter are small (top), large flames only occur when plants are burning (bottom). There are no mysterious black box equations to tell us the answer to this, so it needs sound science. The Forest Flammability Model we have developed is an attempt to join the dots and build a full picture. How high will the flames be from a burning plant? How hot will it be above them at the next plant? How long will those leaves take to ignite? And will the first leaves stay alight long enough for that to happen? The strength of this approach is that every part of it is open to question and improvement. If someone finds that the oils in leaves affect the way they ignite, or that they can better model the angle of a flame, we can build that in to our model. Two identical scenarios, but with different shrub species. Larger flames from the more flammable shrub (right) ignite the tree canopy, causing crown fire. If flammability is about surface fuel load, then old forests are always more flammable than young ones because fuel accumulates. But plants change as fire germinates some, they then grow and others die. 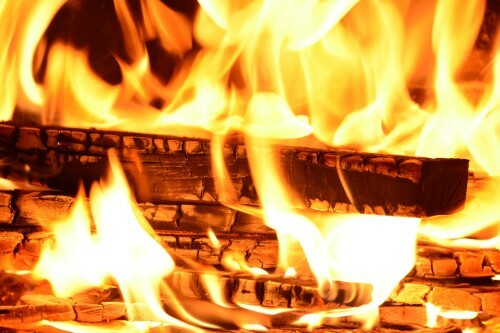 The pattern of flammability could be different in every forest. When I looked at snow gums, I found that our model recreated the same pattern of flammability that we could see from 53 years of mapped history. It broke the established rules as the regrowth was more flammable than the old forests. Our team later looked at 58 sites across eight different ecosystems ranging from woodland to tall wet forest, all burnt under a wide range of conditions that gave everything from tiny flames to 30 metre crown fires. Our model recreated the flame heights with an average error of only 40cm, and correctly predicted larger flames 12 times more often than the best available surface fuel model. The implications of this are significant. We can find where fire belongs and where it doesn’t. We can plan burn prescriptions around the plants they affect, find what the effects of logging or grazing might be and where it’s safe to build. We can see what will happen if more carbon dioxide changes leaves or more heatwaves dry some species. Bushmen have long talked about “kerosene bush” – shrubs that go up in flame like a bonfire soaked with petrol – and ecologists have been studying individual traits that make leaves more or less flammable. This model is the first complete picture of how it all fits together. It means that we are no longer limited to rules of thumb, that we can learn what we should have learnt long ago, the way fire should look in Australia.